Pronouncing Digraph or Blended Sounds! Consonant digraph sounds. That sounds a bit dull doesn’t it? That’s why we prefer to call them Happy Cheese Sounds. And we’ve got a happy, bouncy wedge of cheese to teach them to you in our Digraph Sounds videos. Digraphs are when two letters come together to form a new sound. As our Happy Cheese says in our video, the English language can be a bit silly, and that is certainly the case with digraph sounds. Even so, they’re pretty important for anyone learning English. Here’s everything you need to know about our first three digraph sounds videos. Take ’s’ and ‘h’. ’S’ can have a ssss sound as in ‘snake’. ‘H’ can have a hhhh sound as in ‘hot’. But, put them together and they make an entirely new sound. The sound is ‘sh’, like when you shush someone to tell them to be quiet. The SH digraph sound is very useful for asking someone to be quiet! Next comes ‘c’ and ‘h’. ‘C’ says cccc as in ‘clock’, and sometimes ssss as in ‘face’. But, when you put ‘c’ and ‘h’ together, they too make an entirely new sound. The sound is ch, which sounds like the sound a steam train makes as it chugs along the train tracks: ch, ch, ch, ch. Words that start with ‘ch’ include chair, chicken, and cheese. Words can also end in ‘ch’, like ‘wrench’, ‘ouch’, and ‘sandwich’. The third example is ‘w’ and ‘h’. ‘W’ says wwww as in ‘water’. 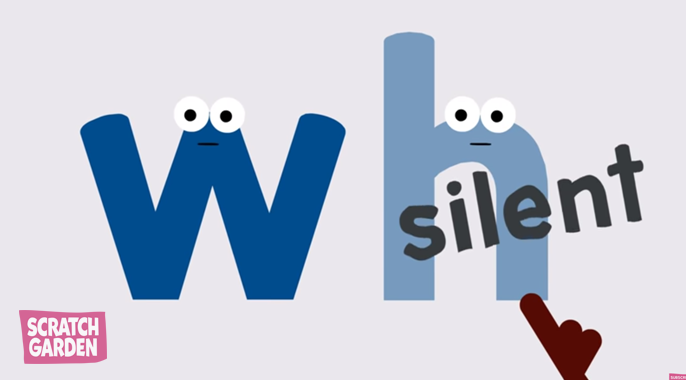 In this case, when ‘w’ and ‘h’ appear together, the ‘h’ becomes silent: it makes no sound at all. As Happy Cheese explains, even if we throw tiny bananas at ‘h’ and ‘h’ gets angry and yells at us, we won’t hear a thing. Examples include wheel, whale and whining. There is an ‘h’ next to the ‘w’ but you don’t hear it. Our videos are really useful in teaching digraphs because there is an opportunity for the viewer to think of their own examples. Happy Cheese encourages everyone to shout out their own digraph words before the timer ends. Watch our digraph videos Now!